Romina Marinkovich had created a pencil-sketched geography game to help home-school her kids. She asked Bek if she’d bring the graphics up to the point where it might attract a publisher, and with a bit of polish it did: IQ Ideas took it on. They figured that Bek had got it this far, so she might as well finish all the elements, and I think she did a gorgeous job. The final result was The Amazing Moa Hunt, which has been a New Zealand best-seller. 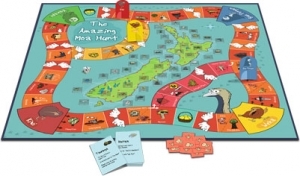 There’s now an expansion called Off The Beaten Track, which features some of the lesser know New Zealand locations, as well as The Great Goanna Hunt (Australian geography) and The Amazing Mammoth Hunt (world geography). 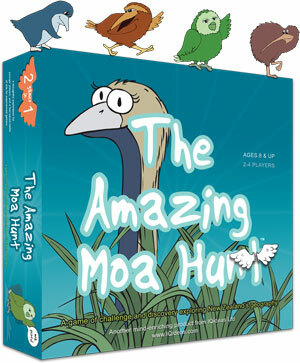 You can find Moa Hunt at Whitcoulls, Paper Plus and many other stores, as well as online at IQ Ideas.